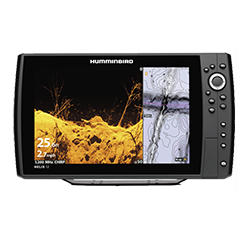 Ideal for anglers that want to know exactly what’s under the boat, the HELIX 12 CHIRP MEGA DI GPS G2N features a large 12.1" display with LED backlight. MEGA Down Imaging gives you a crystal clear picture below your boat so you can see brush, logs, weeds, fish and any other fish holding structure. Dual Spectrum CHIRP 2D Sonar allows for two predefined frequency spectrums. What that means is you get improved target separation, giving you the confidence that what you see on your screen is consistent with what’s in the water. Also includes built-in GPS, Bluetooth, Ethernet networking capabilities, AutoChart Live with depth, vegetation and bottom hardness mapping, and a unit cover.